The Northern China import price of 62% Fe content ore jumped 6.5% on Tuesday to trade at $59.10 per dry metric tonne according to data supplied by The Steel Index. The most actively traded iron ore futures contract on the Dalian Commodity Exchange advanced 6% to 456.5 yuan ($67) per tonne. The price of the steelmaking raw material is now up more than 10% from year lows hit two weeks ago. "High margins after the government's effort to eliminate low-grade steel are enticing mills to produce more steel, which increases the need for iron ore," said Zou Mingdong, Shanghai-based steel manager at Zhongcai Merchants Investment Group. "However, the rising price doesn't change the fundamental situation of oversupply and weak demand." Shares of the world's top iron ore miners reacted positively led by Kumba Iron Ore units trading in New York which surged 6.7% on Tuesday. The South African company, controlled by diversified giant Anglo American, produces more than 40m tonnes per year. The stock is worth $3.6 billion in New York and is trading in positive territory for 2017. Australia's Fortescue Metals Group, a pure play iron ore producer, added 3.8% on the Australian stock exchange and some 10% on US over the counter markets. FMG stock is still down by 18% in 2017 and the Perth-based firm is now worth US$11.5 billion on the ASX. World number one Vale gained 3% in Brazil trading, lifting the Rio de Janeiro-based company's market capitalization to $43.8 billion after 12.6% gains this year. Diversified giants Rio Tinto and BHP Billiton also advanced, up 3.3% and 2.4% respectively, although the Melbourne-based companies both show declines year to date. Today's move in the price goes counter to what most analysts believe is in store for the market which has been in oversupply for more than two years. Morgan Stanley this week sharply cut its forecast for the iron ore price in the third quarter with the investment bank now seeing an average of $50 over the period, climbing to $55 in the final three months. For the year as a whole Morgan Stanley sees the commodity averaging $63 compared to a year-to-date average of $74. Iron ore is expected to continue to soften averaging $58 next year and $54 in 2019. 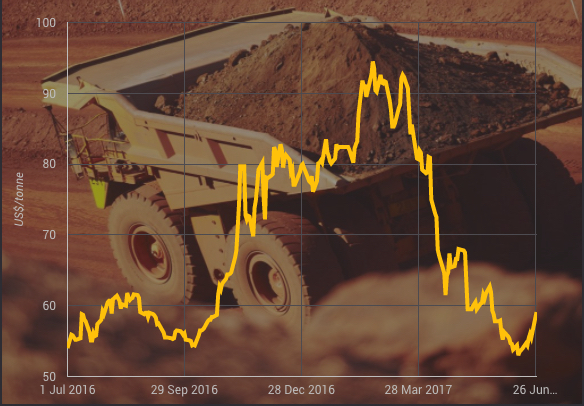 Both analysis blame growing global supply – most notably from Vale's S11D mine and Roy Hill in Australia hitting full production – for the weak outlook. According to Citigroup, 2017 will see a surplus of 118m tonnes following a more than 60m tonnes glut last year. Morgan Stanley predicts nearly 40m tonnes of oversupply this year, growing steadily to top 120m tonnes in 2019 and 185m excess tonnes in 2021.